Here's a superb new online slots game from NetEnt. 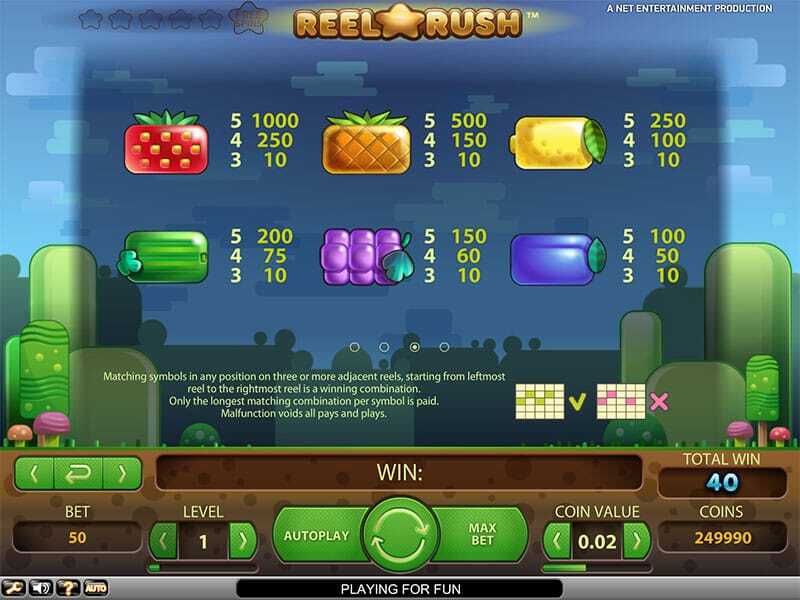 Where to begin with Reel Rush, ah yes, this 5 reel over 5 row video slot from the minds over at online gaming juggernaut: Net Entertainment (NetEnt). What makes this developer great are their intrinsic tendencies to use tried and tested techniques to bind them in a contemporary flurry that has led to some of the most recognisable slots going today. The reputation of this developer speaks for itself and with that in mind let’s discuss the very addictive and exciting game. This slot boasts up to 3,125 ways to win across these reels. Expect all of the telltale NetEnt signs in this slot in the form of wild symbols, free spins, re-spins and many many more. Reel Rush is available to play on multiple devices including mobile, making it very useful on the morning commute if you fancy yourself a cheeky win on the way to work. This is a very fast-paced online slots games that hopefully resonates with the fast paced lifestyle of the players who experience this title for themselves. We would advice playing this slot of you like bright colours and even brighter themes that permeate through the screen as if they are hitting you repeatedly on the head with a hammer made of rainbow. There’s a lot of fruit on offer here, match them in winning pay-lines and you will fill your pockets in no time. If you are a fan of the mobile game Candy Crush, you will find similar footing here. If anything that mobile game inspired this creation, although NetEnt have once again took the ball, kicked it, caught it, then continued to run with it. If you love promo's, get the best online slot free spins. The controls/features in Reel Rush are ones that can be found in many games in the NetEnt catalogue. The control options here are are clearly outlined at the bottom of the screen in the options tab. It is here where you can mute the games soundtrack if it begins to grate on you (dont do it grumpy). The giant button in the middle will kick off the spins, so be sure to set your bets accordingly and proceed. Bets are specifically catered to players of different play styles and backgrounds. If you are someone that likes to bet small and win big then play this slot. If you are someone who likes to bet big and win even bigger then also play this slot — there’s a lot of options here for both parties. In this tab players can customise other features. Personal preference is very much looked after in Reel Rush, one can see this from the moment they say go. Wild symbols in Reel Rush appears on certain reels only. Reels 2, 3, 4 and 5 to be specific, are the reels that the wilds can be found on. There will be an influx of these symbols in the free games feature, a feature that is unlocked by matching these wild symbols by proxy. There is a jackpot in this slot that is worth 480,000 coins which is a lot of dough when you think about it. 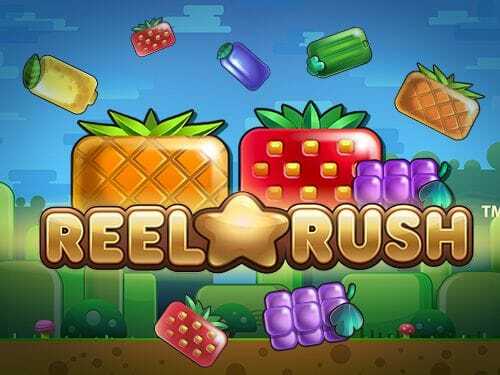 Reel Rush manages to capture the players imagination unlike anything ever seen before. We aren’t just saying this for the sake of it either. This ain’t cognitive dissidence, this is simply fact. Players of any slot discipline will see this from the outset. The features at play here take players on a journey through time and space, back to a time of old, a time where child-like wonder was the driving force behind decisions made in daily life. Not many slots can claim such a feat, a testament to the developer we think. If you are in the market for something to tear up the very fabric of reality with various coloured fruit symbols, then why not do yourself a favour: play this slot and blow your mind. Yes the fruit is juicy, but so to is the amount of money that will be in the players pocket after only a few spins of the reels. 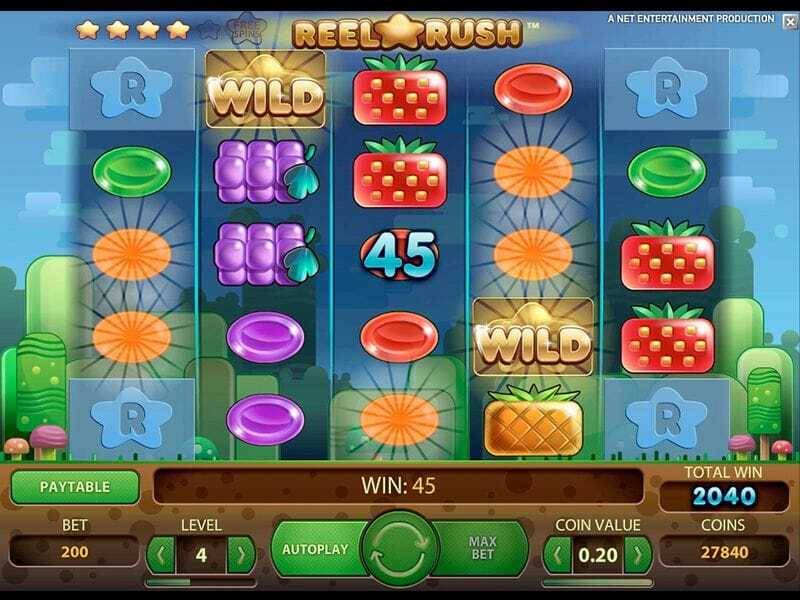 Reel Rush is an experience within itself, but you already knew that by the bight colours that are featured in the thumbnail of this slot. Yes this game was influenced by Candy Crush but yes is also the answer to the question: why have I never experienced this slot before? The way that this slot is layered is reason alone to play this slot. The graphics that pepper in-between fast and rapid gameplay are anything but vapid. This is a slot to go home and tell the kids about, and if you don’t have kids, have some and then wait till they are of age to understand slot gaming, and then tell them. A pleasure on the eyes and that online slot itch that you’ve waited eagerly to scratch. NetEnt have once again managed to defy the expectations that they’ve already set themselves. At this point they are just doing it for fun, and that should be reason alone for players to sit down (or stand up) and play this slot. Fill that colourless void, play Reel Rush today. 9/10 If you enjoyed Reel Rush then you might also like Eastern Dragon.